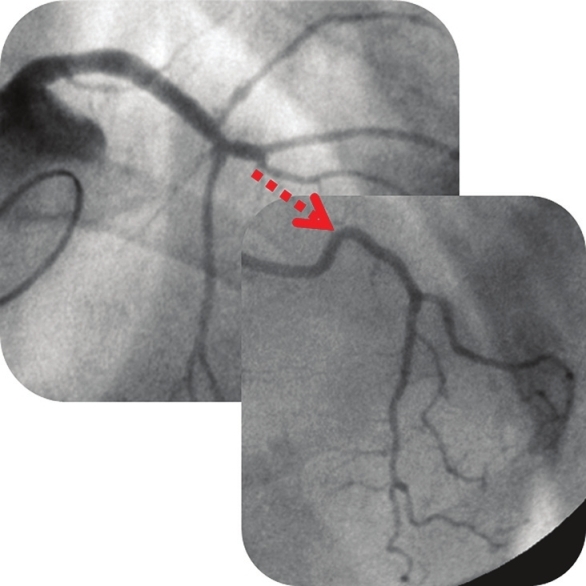 Coronary artery anomalies are uncommon disorders. According to the literature, ≈1% of the general population is affected by a coronary artery abnormality. Coronary artery anomalies are often not associated with clinical signs, symptoms, or complications; nevertheless, they can be associated with congenital heart diseases and lead to sudden death. However, these anomalies are more often discovered as incidental findings at the time of coronary angiography or autopsy. The clinical relevance of coronary artery anomalies is closely related to the functional ability to provide adequate blood supply to the myocardial tissue. 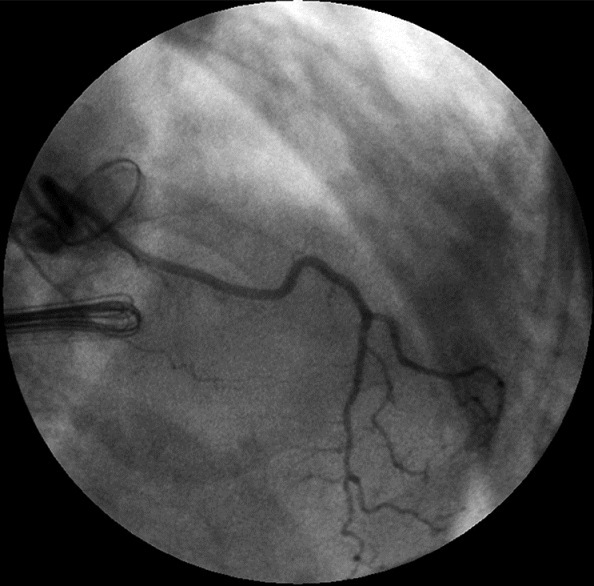 We describe a complex left coronary artery anomaly, not previously reported in medical literature, involving origin, course, and distribution of this vessel. Coronary artery anomalies are uncommon disorders. There is a great physiological variability in origin, course, and distribution of these vessels, and we can assure that do not exist two equal coronary trees. Coronary artery anomalies are often not associated with clinical signs, symptoms, or complications, and they are usually compatible with normal heart development and function, even allowing normal physical activity. Nevertheless, this condition can be fatal, typically in young and previously "healthy" athletes. In fact, as an exception to angina and syncope, sudden death is frequently the only manifestation of anatomic subset. According to the Sudden Death Committee of the American Heart Association, coronary anomalies are responsible for 19% of deaths in athletes. Coronary artery anomalies may also be associated with congenital heart diseases such as great arteries transposition, single ventricle, or tetralogy of Fallot. , However, coronary artery anomalies are more often discovered as incidental findings at the time of coronary angiography (CA) or autopsy. According to the literature, only ≈1% of the general population is affected by a coronary artery abnormality. The clinical relevance of coronary artery anomalies is closely related to the functional ability of anomalous vessels to provide adequate blood supply to the myocardial tissue, with or without significant obstructive coronary disease. We present the case of a 54 years old woman, who was a smoker and was affected by obesity, type 1 diabetes, and hypertension. Eight years before, she had undergone surgical aortic valve replacement with mechanical aortic valve. The patient was admitted to hospital to perform elective surgery for ascending aortic aneurysm. In the last 6 months, she experienced several episodes of typical angina and chest tightness not related to exertion or emotional stress. Echocardiography showed global and regional left ventricular contractile function (left ventricular ejection fraction 56%), mild mitral and tricuspid regurgitation, and ascending aortic aneurysm with maximum diameter of 71 mm. Blood biochemical parameters were within normal range. Electrocardiogram showed T-waves' inversion in anterior and lateral leads. 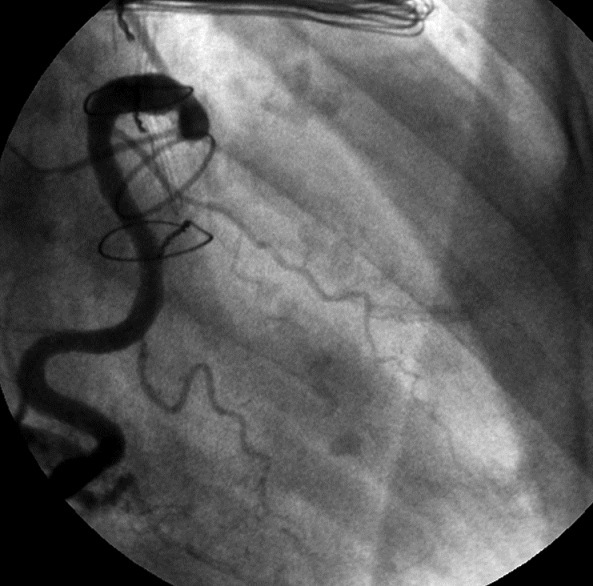 Before surgery, the patient was in coronary angiography (CA). At CA, there was no significant coronary artery stenosis or dynamic obstructions, but we incidentally found a congenital coronary anomaly in the form of peculiar dual left anterior descending artery (LAD) anatomy. LAD arising from the left sinus of Valsalva was short and gave rise to one septal branch, a little intermedius branch, and one diagonal branch [Figure 1]. The left circumflex artery (LCX) was aplastic [Figure 2], and the right coronary artery (RCA) was dominant and normal in origin and course [Figure 3] and [Figure 4]. 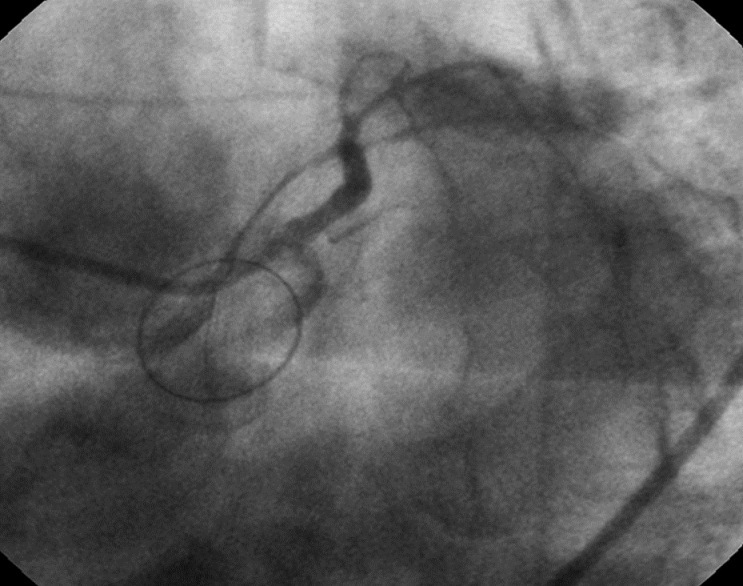 A second LAD was seen arising from the right sinus of Valsalva, with a third ostium different from RCA [Figure 5]. This second LAD was long, run over the right ventricle, and gave rise to septal and diagonal branches, supplying the mid and distal territories of septal, antero-lateral wall, and apex [Figure 6]. Type I: Running in the anterior interventricular sulcus (AIVS), the short LAD is generally the source of all the major proximal septal perforators. The long LAD also runs in the AIVS, descending on the left ventricular side of the AIVS, and then reentering the distal AIVS in order to reach the apex. Type II: The short LAD is the same as in Type I. The long LAD descends over the right ventricular side before reentering the AIVS. Type III: The short LAD is consistent with that described in Types I and II. The long LAD travels intramyocardially in the ventricular septum. Type IV: High in the AIVS, a very short vessel is formed by the LAD proper and the short LAD. From this vessel, the major septal perforators, as well as the diagonal branches originate. The long LAD is unusual in its origin, arising from the RCA. Here, we report a type of dual LAD anatomy that is not included in the angiographic classification previously proposed. 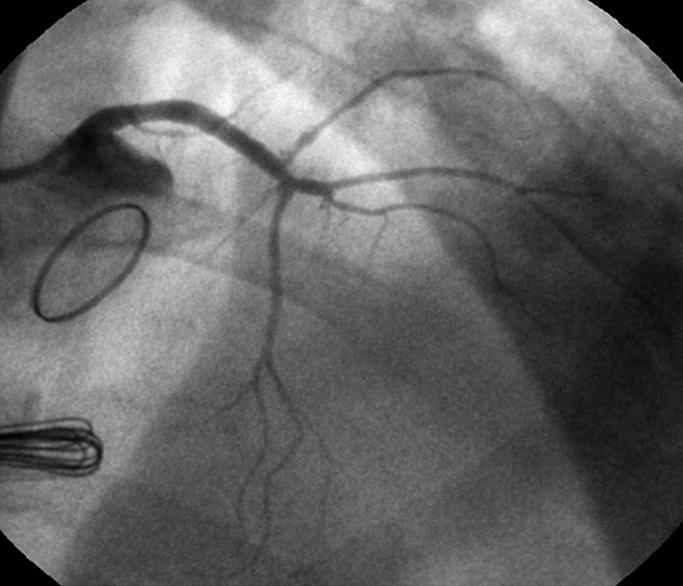 It could be considered as a variant of Type IV, with anomalous LAD origin from an ostium located in the right sinus of Valsalva, separated by the right coronary ostium. Furthermore, the short LAD is a unique vessel with the left main (LM), without LCX wich appears aplastic. Isolated dual LAD, in absence of significant stenosis, has usually little clinical relevance. In fact despite its anomalous anatomy, functional status is often not compromised and does not occur flow reduction, except for rare conditions associated with its route, like ab extrinseco compression, inter-arteriosus course between aorta and pulmonary artery, intramyocardial tract, kinking, or pivot point. We describe for the first time in the literature, a dual LAD anomaly associated with LCX aplasia. We could consider it as a new type of "dual LAD anatomy." It would be important to know this anatomical subset, not only for its peculiar anatomical features, but also, above all, for the implication in terms of any surgical or interventional coronary approach when it should prove necessary. 1. Maron BJ, Thompson PD, Puffer JC, McGrew CA, Strong WB, Douglas PS, et al. Cardiovascular preparticipation screening of competitive athletes: A statement for health professionals from the Sudden Death Committee (Clinical Cardiology) and Congenital Cardiac Defects Committee (Cardiovascular Disease in the Young), American Heart Association. Circulation 1996;94:850-6. 2. Li J, Tulloh RM, Cook A, Schneider M, Ho SY, Anderson RH. Coronary arterial origins in transposition of the great arteries: Factors that affect outcome. A morphological and clinical study. Heart 2000;83:320-5. 3. Carvalho JS, Silva CM, Rigby ML, Shinebourne EA. Angiographic diagnosis of anomalous coronary artery in tetralogy of Fallot. Br Heart J 1993;70:75-8. 4. Yamanaka O, Hobbs RE. Coronary artery anomalies in 126,595 patients undergoing coronary arteriography. Cathet Cardiovasc Diagn 1990;21:28-40. 5. Spindola-Franco H, Grose R, Solomon N. Dual left anterior descending coronary artery: Angiographic description of important variants and surgical implications. Am Heart J 1983;105:445-55. 6. Ono M, Brown DA, Wolf RK. Two cases of anomalous origin of LAD from right coronary artery requiring coronary artery bypass. Cardiovasc Surg 2003;11:90-2. 7. Sajja LR, Faroogi A, Shaik MS, Yarlagadda RB, Baruah DK, Pothineni RB. 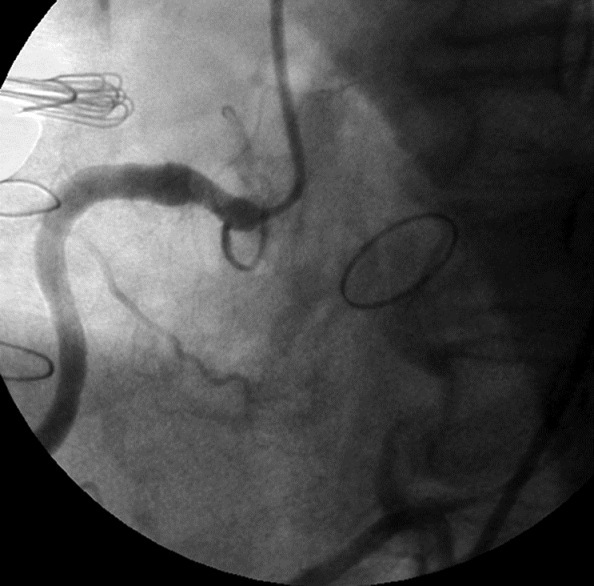 Dual left anterior descending coronary artery: Surgical revascularization in 4 patients. Tex Heart Inst J 2000;27:292-6.